When I was living with a performance-oriented mindset nothing was more contaminated than my prayer life. I figured if I prayed longer, earlier, more earnestly, with more spiritual words, then I’d please God more and get more positive answers! On my knees? Even better. Flat on my face? How spiritual of me! Well, I was praying as if I had to break through God’s deafness or inattention. But a parable is not an allegory, where every single element means something else. Instead it’s more like a joke — a story with a punch line, only in the case of the parables it’s a punchy truth. The truth here is that if even an unjust judge will respond to a politically unimportant person’s repeated request, then how much more does your loving Heavenly Father hear you. But you are not like the widow, and God is not like the judge. First of all, you are not poor and abandoned like the widow — you are the beloved child of God and a co-heir with Christ! Second, God is not like the judge at all — He’s not crooked or uncaring or indisposed, but righteous and loving and always available. So how should you pray? The Lord’s Prayer that follows is a great model of prayer that really is saying grace. First, it’s short. About 50 words. That implies total confidence that God is listening. No babbling to impress God here. Second, it starts with the words Our Father. Never forget you’re a child praying to a Father who couldn’t love you more than He does right now. Third, it’s a prayer of surrender. Thy will be done. It’s not all about you. Fourth, your needs are expressed simply: Give us this day our daily bread. No begging or bargaining. Why do that with a gracious God? And fifth, it reminds you to give grace like you desire grace: Forgive us our debts as we forgive our debtors. 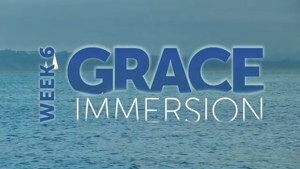 Nothing will revitalize and relax your prayer life more than really saying grace! And in prayer and meditation, instead of endless requests, you’ll spend more time in contemplation of the really moving wonder of God’s grace! That starts tomorrow! How would you summarize what Jesus teaches about prayer in Matthew 6? How can you avoid the trap of performance-oriented prayers? Try the Lord’s Prayer model today: First pray the very words of that prayer, with meaning. Then use it as a pattern for a prayer in your own words — express adoration, surrender, gratitude for grace, and request strength to be gracious to others.